Posted March 15th, 2017 by Jenny & filed under Uncategorised . So this month we have decided to take our facial treatments to a new level. 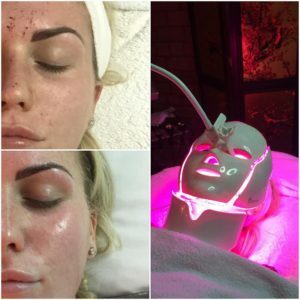 We have bought an amazing new machine into the salon which focuses on total skin rejuvenation. Using red and blue lights which target different skins. Working on all skin types and concerns emitting 630nm, a wavelength of light for skin rejuvenation. It reaches into deeper layers of the skin, increasing blood circulation and increasing levels of oxygen and nutrients in the skin. Combating the signs of ageing and leaves the skin looking and feeling more pump! The red light is used for hydrating, soothing and healing the skin. This can also be used after botox, fillers and semi permanent makeup to reduce swelling and speed up healing time. The blue light works on reducing bacteria in the skin for severe acne skins. Both lights can be used together to balance the levels in the skin. This facial can be used a stand alone luxury treatment or express treatment. Or added onto any of our other facials to help penetrate the products deeper into the skin for added benefits. Acne and scarring, anti ageing, hydrating, fades age spots, sun damage, improves muscle tone, nourishes, tones and tightens. What more could you ask for? Courses of this facial are recommended for optimal results. Also great as a build up before a big event such as weddings! Often used by celebs before the red carpet! Call us today to try this great new treatment! Prices range from £40-70 for single treatments, £108- 590 for courses.